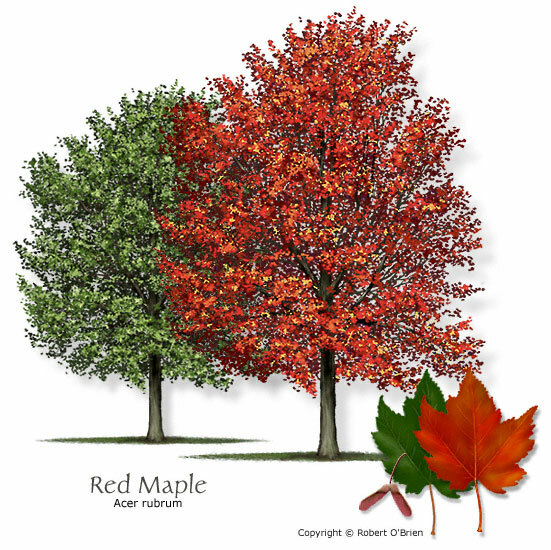 Unlike the U-shaped leaf margins of the Sugar Maple (think Canadian flag), Red Maple leaves have a V-shaped margin. Leaves offer the easiest way to distinguish it from its relatives; they are simple, opposite, have serrated margins, and variable in pubescence but lower surfaces usually whitish. Named for the strong red tones to virtually all parts of the tree: twigs, buds, petiole (leafstalk), fruit, autumn leaves, and female flowers all possess a deep scarlet color. This is a medium to large tree (60-90 ft. in height; 2-3 ft. in diameter), with unisexual flowers, light gray bark, and samara fruit. It occurs in a wide range of habitats throughout the Southeast, including low, wet areas, along streams, in floodplains, and in drier upland sites. Red maple also frequently occurs on open disturbed sites in almost pure stands. Economically, red maple wood is of poorer quality than that of sugar maple or other hard maples, but large trees are frequently used for veneer and lower grades of furniture. Smaller trees are most often harvested for pulpwood and fuelwood. It is a favorite ornamental shade tree beause of its rapid growth in a wide range of sites. Appealing traits include bright flowers and fruit in early spring before leaves appear. The tree is relatively free of insects and disease.